The first item is to decide how you will define "organic." The definition of organic has been bandied about in the labeling wars, but when referring to a garden, it's really about pesticides and fertilizers more than anything else. An organic garden has no chemical from any source that would not be biodegradable or would be harmful to birds or wildlife. However, some "organic" gardens have synthetic substances, others do not. Decide for yourself and consider everything that goes into the garden. Planning is crucial to a successful organic garden. You need to consider the layout of your plots. North-facing gardens in the southern hemisphere and south-facing gardens in the northern hemisphere are best. If your area is windy, you will need to find solutions for this, too. Fencing and wind barrier plantings are popular ways to block excessive wind. Having water close by is just as important. Installing an irrigation system with a timer is an ideal way to go. It will make the difference between enjoying your garden and being a slave to it. If you are planting trees and shrubs, check what their mature size will be. Many shrubs and trees are difficult to move. Trees will grow and make shade, so don't forget they do this. Sun-loving plants and flowers can't thrive in the shade. » You want to place your garden somewhere that gets at least six hours of sunshine and is close to a source of water. You want to be sure the soil drains well. Consider building a raised bed. It will ensure good drainage as well as keeping the soil suitably warm. » Next, weed the garden area thoroughly. Mow, pull and dig up their roots. Till the soil and rake it smooth. Make sure there are no more sprouts. If so, pull them out as well. » You want great nutrient-rich soil for your garden. You can make your own compost with organic materials. Use fallen leaves, pulled weeds before they go to seed, eggshells, coffee grounds and grass clippings. You can also purchase it at a local nursery. Till this into the soil to feed your plants, and use leftovers as mulch. You want at least six inches of loose soil. » Only use plants that will thrive in your region. Make sure to choose plants that are right for your hardiness zone. Look for plants that have a proven record of success and disease resistance. And always start from seeds. 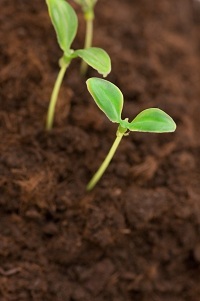 Nursery plants will most likely have some amount of chemical fertilizer or pesticide on them. » Tend your garden well. A small organic garden that thrives is more important than a large one that fails. Use heaps of organic mulch to help suppress weeds. Try wood chips or grass clippings. The mulch will also keep the soil moist so you don't need to water as often. Use friendly insects, like ladybugs, to help keep your garden healthy and organic!